The San Francisco Giants visit Miller Park on Tuesday, June 6, 2017 to play the Milwaukee Brewers. The probable starters are Matt Cain for the Giants and Chase Anderson for the Brewers. The opening line for this matchup has San Francisco at +124 and Milwaukee at -134. The Giants have a 26-28-4 over/under record and a 24-34-0 run line mark. The Brewers are 37-20-0 against the run line and have a 32-23-2 over/under record. The Giants have a 23-35 overall record this season. Starting pitcher Matt Cain has a 3-4 record with an earned run average of 4.53 and a WHIP of 1.54. He has 39 strikeouts over his 59.2 innings pitched and he's given up 67 hits. He allows 10.1 hits per 9 innings and he has a FIP of 4.3. The bullpen has an earned run average of 3.99 and they have given up 159 base hits on the year. Teams are hitting .247 against the bullpen and they've struck out 153 hitters and walked 74 batters. As a team, San Francisco allows 9.1 hits per nine innings while striking out 7.9 batters per nine innings. They are 16th in the league in team earned run average at 4.21. The Giants pitchers collectively have given up 527 base hits and 245 earned runs. They have allowed 57 home runs this season, ranking them 30th in the league. San Francisco as a pitching staff has walked 168 batters and struck out 457. They have walked 2.9 men per 9 innings while striking out 7.9 per 9. They have a team WHIP of 1.33 and their FIP as a unit is 3.80. As a team San Francisco is hitting .231, good for 29th in the league. The Giants hold a .352 team slugging percentage and an on-base percentage of .293, which is good for 28th in baseball. They rank 27th in MLB with 7.8 hits per game. Brandon Crawford is hitting .268 with an on-base percentage of .296. He has 42 hits this season in 157 at bats with 24 runs batted in. He has a slugging percentage of .427 and an OPS+ of 92. Buster Posey is hitting .343 this year and he has an on-base percentage of .439. He has totaled 57 hits and he has driven in 14 men in 166 at bats. His OPS+ is 156 while his slugging percentage is at .512. The Giants have 455 hits, including 92 doubles and 44 home runs. San Francisco has walked 167 times so far this season and they have struck out 435 times as a unit. They have left 390 men on base and have a team OPS of .645. They score 3.5 runs per contest and have scored a total of 203 runs this year. Milwaukee has a 30-27 overall mark this year. With an earned run average of 3.30, Chase Anderson has a 4-1 record and a 1.26 WHIP. He has 59 strikeouts over the 62.2 innings he's pitched. He's also given up 56 hits. He allows 8 hits per nine innings and his FIP stands at 3.4. The bullpen has an earned run average of 4.05 and they have given up 197 base hits on the year. Teams are hitting .250 against the Brewers bullpen. Their relievers have struck out 197 batters and walked 101 opposing hitters. As a team, Milwaukee allows 8.9 hits per nine innings while striking out 8 batters per nine innings. They are 9th in the league in team earned run average at 4.04. The Brewers pitchers as a team have surrendered 511 base knocks and 232 earned runs this season. They have given up 63 home runs this year, which ranks 23rd in Major League Baseball. Milwaukee as a staff has walked 200 hitters and struck out 458 batters. They give up a walk 3.5 times per 9 innings while they strike out 8 per 9. Their team WHIP is 1.38 while their FIP as a staff is 4.13. As a team, they are batting .250, good for 15th in the league. The Brewers hold a .439 team slugging percentage and an on-base percentage of .325, which is good for 12th in baseball. They rank 14th in MLB with 8.6 hits per contest. Travis Shaw comes into this matchup batting .292 with an OBP of .339. He has 59 hits this year along with 40 RBI in 202 AB's. He maintains a slugging percentage of .530 with an OPS+ of 124. 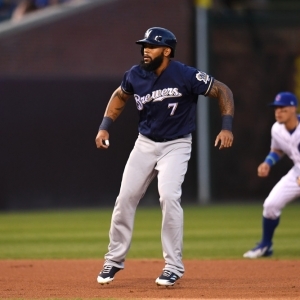 Eric Thames is hitting .273 this season and he has an OBP of .413. He has collected 47 hits in 172 at bats while driving in 29 runs. He has an OPS+ of 163 and a slugging percentage of .605. The Brewers as a unit have 490 base hits, including 105 doubles and 80 homers. Milwaukee has walked 198 times this year and they have struck out on 558 occasions. They have had 376 men left on base and have an OPS of .764. They have scored 4.98 runs per game and totaled 284 runs this season. Who will win tonight's Giants/Brewers MLB game against the spread?